Processes are tasks that must be performed by a company to function successfully, so it’s important to reassess them constantly to find any kinks in the chain. A good process is architected immaculately, leaving no piece unaccounted for. Our template’s platform provides you with a transparent picture of what needs to be done during your process management. Here, you can identify and modify existing processes to be aligned with current and desired future company goals. With this template, you can easily measure, analyze, re-design, monitor, implement and manage all ongoing processes. You can clearly organize and label all upcoming project tasks and desired outcomes to ensure your attention isn’t being accidentally steered in the wrong direction. This template is flexible and can be customized to your suiting with labels and colors, in order to guarantee easy and efficient project management. With this template, you’ll be able to transform your projects and to improve business operations. You can realign your process management with company goals by laying out all project plans. Also, you’ll be able to analyze and improve business projects to optimize the workflow and to increase productivity. This template enables you to study, identify, change, and monitor every business process to ensure it runs smoothly and that it can be improved over time. You’ll be able to monitor a process from start to finish and to identify what tasks need to be taken care of. 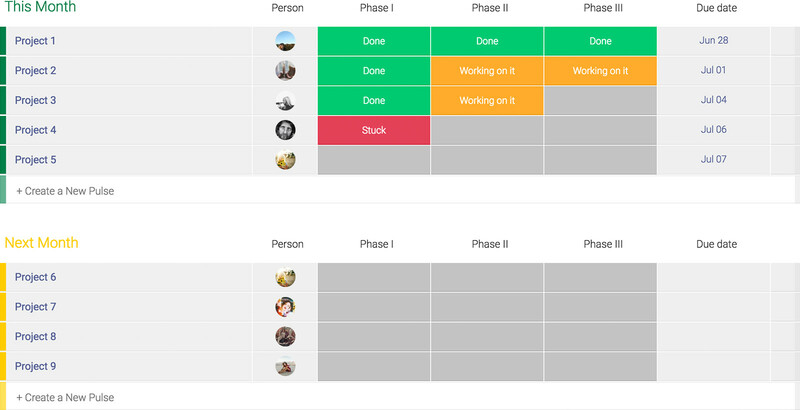 The process management template helps you keep track of all projects and management plans. You can also reassign tasks to employees in case any necessary improvements are needed. Gain knowledgeable insights and formalize new and improved ways to get work done!